That’s reportedly what a BBC film crew heard while they were detained after breaching the perimeter at Nevada’s infamous Area 51. Here is the story of what happened. A British film crew, including “respected UFO investigator” Darren Perks and eleven others, were filming for an upcoming special entitled Conspiracy Road Trip: UFOs. The gist of the program is a bus-load of people drive around and ask people about UFOs. The incident occurred on May 14 of this year at Nellis Air Force Base in the Southern Nevada desert. 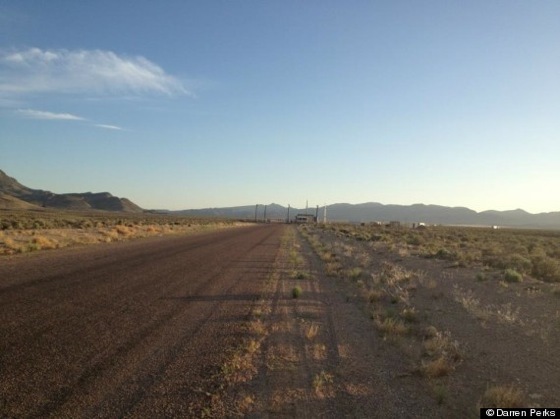 Long rumored to be Area 51, where the military secretly studies UFOs, it is now generally accepted that the base is where secret spy planes are developed and tested. 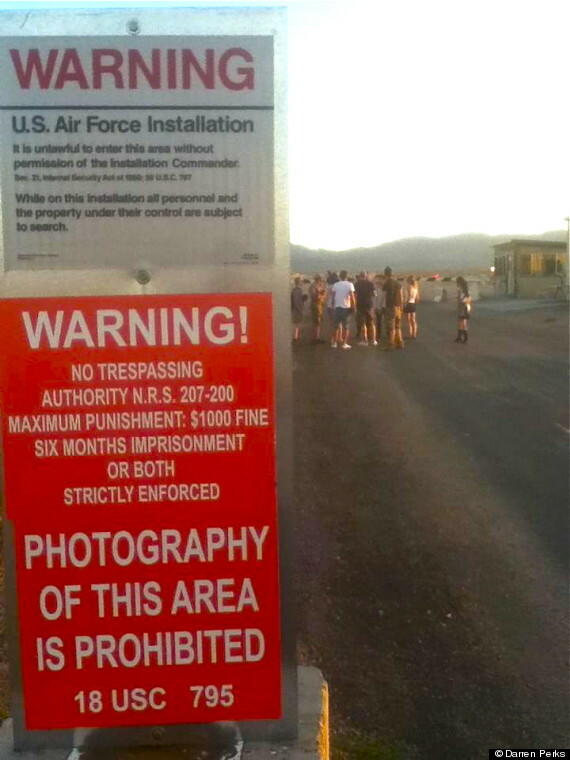 When the crew pulled up to a gate that appeared unmanned, they continued onto the base, despite the numerous, highly visible “No Trespassing” signs. Which is precisely what the crew did. Once they were well inside the gate, filming all the while, the guards made their presence known and things escalated. We walked onto the base in plain view, and in so doing, we breached the security gate…We went past the boundaries by at least 200 yards, and after another 30 minutes of filming, one of the cameramen went over and knocked on the door [where the security guards were]. Eight guards wearing combat fatigues immediately came out with their assault rifles and they grabbed us, forced us to the ground and we were all made to lie facedown in a row on the tarmac with a gun at our back. Perks and the crew claim that they were made to lay face down on the desert floor for upwards of three hours, while their cameras, equipment, and wallets were confiscated, and until the sheriffs arrived on the scene. Lee, whose team had to come from 45-miles away, disputes this claim, saying that from the time he received the call to the time they arrived, only 30-minutes elapsed. A misdemeanor trespassing violation, the members of the crew were cited and temporarily detained on site while a cursory investigation was performed. This is when, engaging the guards in casual conversation—at least as casual as it can be when you’re being held by police and armed military guards—those previously mentioned quips about shooting and disappearing took place. It was a wrong thing that we did, and there will be a lot of people in the States that don’t like it. The thing is, it happened, it wasn’t staged or set up. We went there to film and overstepped the mark—we went a bit too far. After a few months the crew received their confiscated footage, with a few bits and pieces wiped. The special, Conspiracy Road Trip: UFOs aired Monday, October 15th on the BBC. Nellis is NOT Area 51. It’s a straight forward Air Base, that now, because of the city growing, is in Las Vegas. Area 51 is North of Vegas at Groom Lake. I guess we better move the alien bodies somewhere nobody wants to visit, like any house belonging to the member of the Jersey Shore cast or Oprah’s basement.